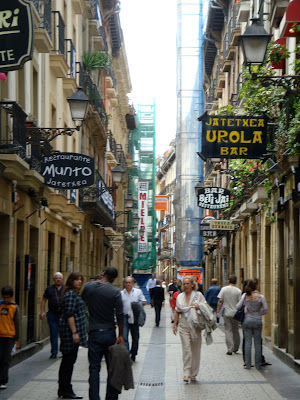 On Monday we spent the day exploring San Sebastian's charming old quarter. Rich with historical treasures, its narrow cobbled streets were a virtual maze of street stalls, specialty shops, cafes, restaurants and tapas bars! The tapas were all laid out at all but the fanciest bars for delectable bites of special treats. 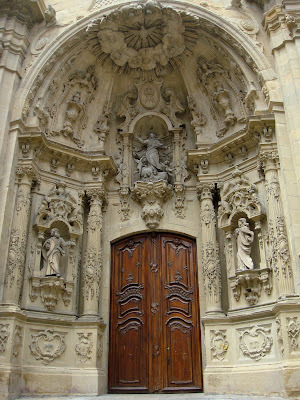 We explored some of the main attractions which included the Baroque Church of Santa Maria, the Gothic Church of San Vicente, and the Museo de San Telemo, a former 16th century convent. San Sebastian is most definitley a place that exudes a certain air and charm - characteristics which can only be found in old places worn out by non-stop activity, history and festivity.